I wrote earlier about King Rooster, who put himself at the top of the pecking order despite his smaller stature. Sadly, King Rooster sleeps under the roots of a lilac tree tonight. A few days ago Angelika found him staying very still in the pen. He'd fallen from the top of the pecking order and had seemed beaten up and frantic in the past, but this was different. He didn't seem able to use his legs. We brought him in in a dog crate for a few days, but he didn't get any better. A vet friend of ours looked at him and didn't think he'd get better, so we decided that, alas, it was time to try the killing cone. As we were setting up, it started to sprinkle. As I actually slaughtered him, it thundered. It rained while Angelika dug his grave, and then the sun came out as she finished planting a lilac on top of him. It was my first time doing it, and not perfect. Still, I think he's better off under the lilac than sitting sadly in the dog crate, looking confused about what happened to him. He might have been sick, or he might have been injured somehow. He clearly wasn't happy. 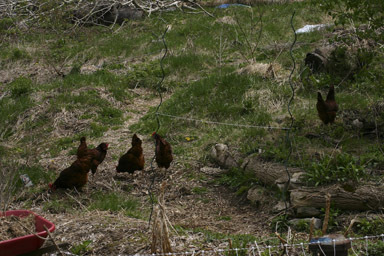 The rest of the chickens - our older ones and the rest that had arrived with him - seem fine. He hadn't seemed happy since losing his place in the pecking order, but I hadn't imagined that this would happen, or that anything like it would happen to the one member of our flocks who really stood out as a unique character. Everybody's doing it, it seems. I wonder how many of us are surprised to hear that there's a sudden huge uptick of interest in growing vegetables? Wow - it's been a long time since I've posted here. It's easier to blog about the planning process in winter, when writing is just kind of an aid to thinking things through, than when you actually need to be out there doing it. We've done something strange in the garden. Strange? Us? Most people don't have ducks and chickens in their gardens, but those who do seem to mostly keep their poultry in coops or let them wander, or maybe put them in a movable chicken tractor. We did let the chickens wander around for most of May, until we'd put plants in that we feared they might scratch out, and now they're annoyed to be stuck in their coop and run. Tractors are difficult on our hilly land, which is terraced, but pretty irregularly. 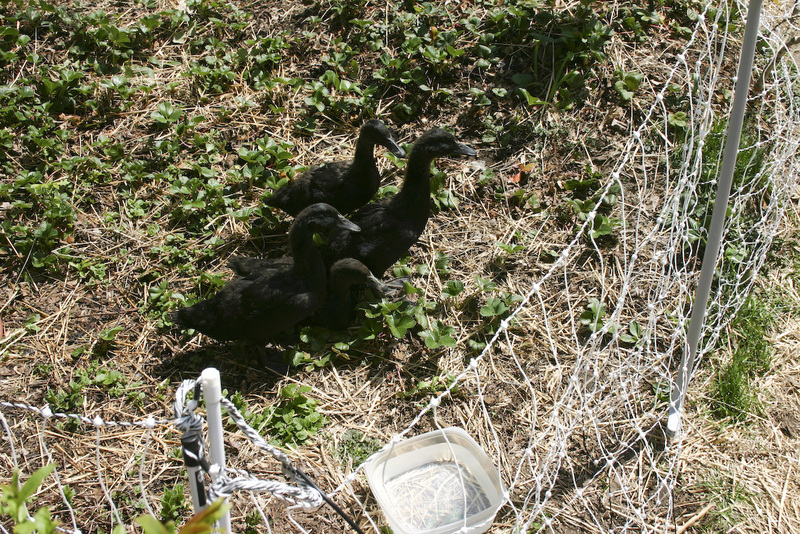 The ducks were our most immediate problem, as we needed to move them out of the too-small 12' x 12' cage they were in. Even after we'd calmed down Darth, the ducks still clearly needed more room. We decided to try something different, as it was something Angelika was planning to use in her orchard anyway: electroplastic netting, from Premier1. It's not a huge shock - I can leave my hand against it, and it's kind of like a static shock. I did give myself a bit of a jolt one wet morning, leaning into a wet fence at multiple points while standing in wet grass, but even that wasn't too bad. It seems like the standard net is 160' long, making a 40' x 40' square, but that seemed enormous, so we bought a smaller 80' net to make a 20' by 20' square. Put into a garden, that's still a huge amount of space. We had wanted to cover the strawberry patch and see if we could reduce its huge slug count, but wound up with the patch as one corner of a much larger area. I also hadn't ordered enough "Power Posts" to provide extra support, and it was a pretty sagging fence. 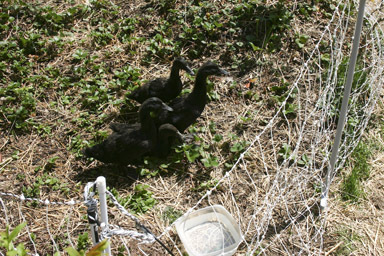 Ducks fenced in the strawberry patch. Still, the main point was to keep predators out, and the dogs and cats seemed to learn very quickly not to mess with the fence. We put four ducks in and watched to see what happened. Mostly, they seemed like pretty happy ducks, except for one who got herself stuck in the fence. I had to let Darth out of his isolation cage so that she could use his space to recover. (Ducks seem to pick at each other's injuries, making a minor scrape into a major disaster.) She spent three days there - she seemed fine after a day, but I wanted to be sure she was fine before mixing her back in. And I had to repair the fence, crimping some copper rings onto it where I'd cut it to free her. Since then, I've added a lot more posts to make sure that the fence is taut, free of places where ducks could climb in or predators could climb through. We now have all of the ducks in the fence in the back, and have moved it around periodically when they'd destroyed/fertilized an area enough. Unfortunately, we also chopped down a few trees in the back to make more room for the huge duck area we're planning, and still have to clear the debris, so we've run out of room to move the fence easily. I'm going to move them to an area closer to the road, a narrow and long area between my driveway and the neighbors' property, which I can't use for very much else thanks to some crazily zealous setback requirements. The ducks will be getting a bigger fenced-in area here, and hopefully having three times the area will reduce their ability to destroy it. This year they can fertilize this lost area, and next year I'll plant it with currants, gooseberries, and other shade-loving fruit producers. I should also note that I now have nine ducks, down from eleven. No, we didn't eat them. We were planning to slaughter three drakes on Memorial Day, but we were too slow - they had already begun molting, and were covered in pinfeathers that would have taken eternity to pluck. They got a reprieve and were returned to the main group. The two that left, now "Betty and Bob", moved this weekend to East Randolph, New York, to live with a friend's parents. I hope they'll enjoy their new place and produce a lot of ducklings. If you'd like to see more, I've posted a gallery of pictures.